370EZ Steel Slide series. The EZ latch provides a pinch free, colored touch point for unlocking the slides for closing and for disconnectiong the inner slide member. The EZ Rail latch allows the inner slide member to be installed with the cabinet section fully closed. The inner slide members can be installed with a single direction closing motion without the need to disengage the lock forward mechanism. Jonathan Engineered Solutions offers a complete line of high-quality industrial grade steel drawer slides. Our array of industrial grade steel slides includes ball bearing drawer slides, friction slides, roller bearing drawer slides, and solid bearing drawer slides. 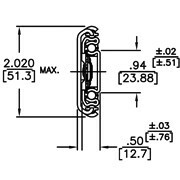 The 370EZ series steel slides are 2.02" x .50" wide and manufactured in carbon steel with standard zinc plating. The 370EZ is a 3 section slide with a load rating of up to 235 lbs. The majority of our steel slides are custom engineered for specific applications. We also carry a broad line of standard steel slides, available with various lengths, travels, features, functionality, and more. With an accumulated mechanical engineering knowledge base that relates to industrial grade steel slides, custom manufacturing capabilities, and a global footprint, we are the ideal source for all of your drawer slide requirements.